Outlast was kind of a fresh take on modern horror games in that like Amnesia: The Dark Descent before it you play as a protagonist who is essentially powerless. It took place in an insane asylum where the patients had all escaped and in which you playing as an investigative reporter found yourself trapped. Your only choice was to sneak around, and frequently flee and hide should one of the crazies find you. I enjoyed it, though was a bit too much stealth for me. This was followed up in 2014 with stand alone DLC that improved a lot of the issues I had. Now with Outlast 2 on the horizon I have high hopes this will improve even on that. This time the game takes place in Arizona in the Sonoran desert, again you play as a reporter, this time you are on the search for your wife who went missing after you both crashed in the area. Like the first game it again utilises the awesome concept of being a playable found footage game. Your only tool is a camera that also has a nifty night vision mode that helps you to see in the dark, but with the caveat that it needs batteries to be able to do this. The demo is around twenty minutes long and gives a good sense of what the game is to be like, my thoughts are all based off this demo so they may be incorrect. An added gameplay device is that your character wears glasses, at a few points they fell off which had the effect of making the whole game look really blurry, something interesting. Starting off in the desert I was worried how it would all work. Being in an asylum is one thing as a linear path can seem more open due to blocked doorways and such things, here though for what is meant to be an open location I thought maybe the game would feel more boxed in. Initially it does, canyon walls force you down a path but thankfully it soon got changed up. 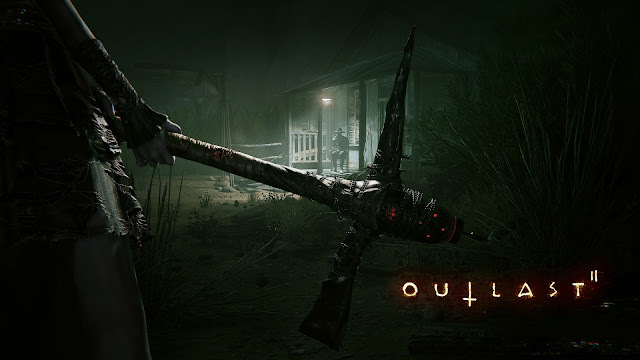 The crux of the demo is that you are searching for your wife and come across some type of Satanic cultist compound, like the first game it seems that not everyone you meet are openly hostile to you, glad that remains as that felt fresh. Eventually the location changes in quite a strange way. A Cthulhu style mass of tentacles grabs you and your suddenly transported to a school that seems to refer to your past. There were plenty of supernatural elements such as creepy voices and ghost like apparitions, the first game hinted at supernatural happenings, it seems this is going to be more pronounced this time around. There were a few bizarre ways to transition between locations, at one point for instance you walk into a locker only to find yourself now in a classroom elsewhere. I wonder if the whole game is going to be this dream like process of warping between disparate places or if there will be some semblance of normality.